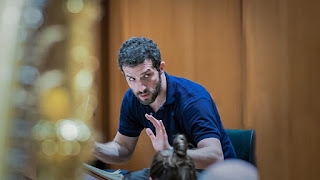 Omer Meir Wellber's first appearance at the helm of the BBC Philharmonic will also be his debut at the 2019 season of the BBC Proms in London, and his first Manchester concert as Chief Conductor will be in September 2019. Omer succeeds Spanish maestro Juanjo Mena, who led the BBC Philharmonic from 2011 until August this year.will conduct the orchestra in its concert series at the Bridgewater Hall in Manchester as well as at the BBC Proms in London and on international tours. All the concerts are recorded or broadcast live on BBC Radio 3. He will also give concerts around the North and beyond including in Leeds, Stoke on Trent and Nottingham. However, as this little clip shows, it's not just conducting that he's good at.